The Gandhāran Buddhist Texts are the earliest Buddhist manuscripts yet discovered, and indeed the earliest Indian manuscripts yet discovered. They are written in Gāndhārī using the Kharoṣṭhī script. In 1994 the British Library acquired a group of some eighty Gandharan manuscript fragments of the 1st or 2nd century. They were written on birch bark and stored in clay jars, which preserved them. A team has been at work, trying to decipher that manuscript: three volumes have appeared. One more manuscript, written on birch bark in a Buddhist monastery of the abhidharma tradition, also in the 1st or 2nd century CE, was acquired from a collector by the University of Washington Libraries in 2002. It is an early commentary on the Buddha’s teachings, on the subject of human suffering. The Gandhāran texts are in a considerably deteriorated form (their survival at all is miraculous), but educated guesses about reconstruction have been possible in several cases using both modern preservation techniques and more traditional textual scholarship, comparing previously known Pāli and Buddhist Hybrid Sanskrit versions of texts. Scholarly critical editions of the texts are being printed by the University of Washington Press in the «Gandhāran Buddhist Texts» series, beginning with a detailed analysis of the Ghāndārī Rhinoceros Sutra including phonology, morphology, orthography, paleography, etc. 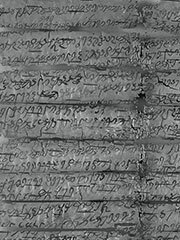 In 1892 a copy of the Dhammapada written in the Gandhārī Prakrit was discovered near Khotan in Xinjiang, western China. It came to Europe in parts, some going to Russia and some to France. In 1898 most of the French material was published in the Journal Asiatique. In 1962 John Brough published the collected Russian and French fragments with a commentary. In 2003 Timothy Lenz published an edition of a new fragment of a Gandhari Dharmapada now in London. Salomon, Richard. A Gāndhārī Version of the Rhinoceros Sutra: British Library Kharoṣṭhi Fragment 5B Univ. of Washington Press: Seattle and London, 2000.